Just Eat More (fruit & veg) Recipe idea - Yellow Split Pea Soup Ingredients: (Serves 6) 350g Great Scot Yellow Split Peas 1tbsp Olive Oil 4 Smoked Streaky Bacon Rashers, diced 2 Medium Onions, diced 3 Carrots, diced 3 Celery Sticks, diced 2 Garlic Cloves, crushed 1.5lt Chicken Stock 1 Bouquet Garni Salt & Black Pepper Method... 1. Soak the peas to the on pack instructions & drain. 2. Heat the oil in a large saucepan or stock pot over a medium heat, add the bacon, onions, carrots, celery & garlic. Fry until the bacon is lightly coloured & the onions are translucent. 3. Add the yellow split peas, chicken stock & bouquet garni. Bring to the boil, then reduce the heat & simmer gently for 1 hour or until the peas & vegetables are very soft. 4. Remove the bouquet garni & purée in a food processor. Return to the saucepan, season to taste & re-heat before serving. Do not eat raw.1. 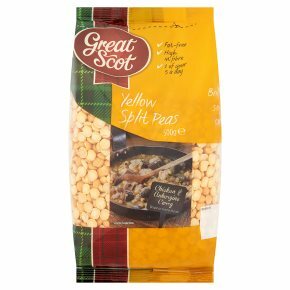 Cover Great Scot Yellow Split Peas in plenty of cold water & soak for 8-12 hours.2. Rinse thoroughly, place in a saucepan & cover with fresh water. Boil for 10 minutes, reduce heat & simmer for 30 minutes or until tender.3. Drain & use.